1 - Driving - just enjoy the ride! All activities are open to any member regardless of ability - and they are all FUN! We also enjoy coffee mornings, quizzes and trips to the mainland. Our nearest neighbour RDA group is the New Forest and we have the privilege of visiting them as well as entertaining them on our fun days. On three occasions our members have been awarded trophies by the Isle of Wight Sports Council. 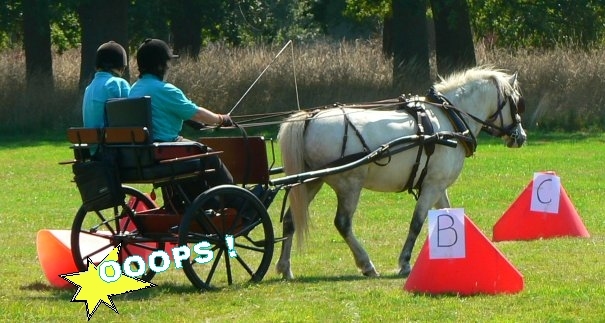 Driving a cone course . . . . . .
We aim to give training to attain a high standard in all aspects of carriage driving. Harness - (What is it? How do you put it on? How do you take it off? And how to make it fit). Drivers may take proficiency tests to increase and demonstrate their ability and knowledge. 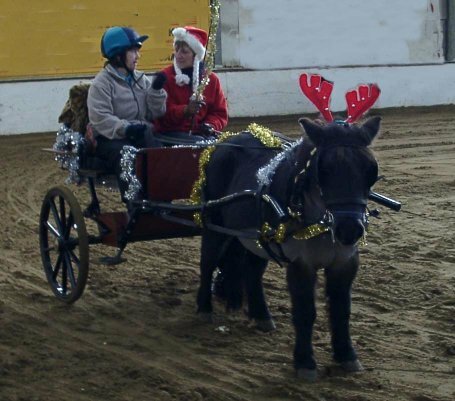 They can compete in RDA and British Driving Society (BDS) Shows that have disabled classes. Some drivers could progress outside of RDA and attend training days to compete internationally. Carriage driving uses trained, non-disabled volunteers, who sit alongside the driver to teach skills and help if required.